One of the quickest ways to make me roll my eyes (other than using tired talking points or debunked stories, bad jokes, hyperpartisanship …) is to use a hackneyed portmanteau word. “Brexit” caused so much eye-rolling, I thought about trying to secure a sponsorship from Duck Brand tape. 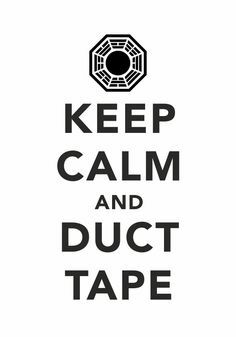 If duct tape can’t fix that, nothing can. 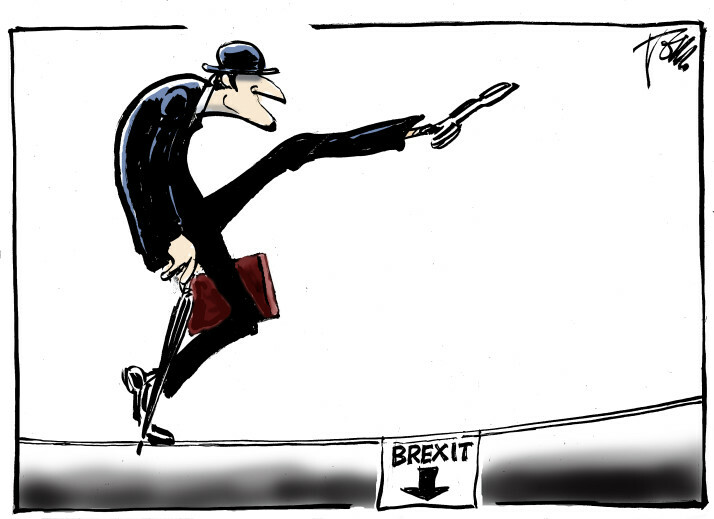 What will happen to the Ministry of Silly Walks? I need to know!!! Editorial cartoon by Tom Janssen. He argued that it might even be the worst political portmanteau in history, noting, “While ‘Czexit’ sounds like a combo of ‘Czech’ and ‘exit’, ‘Brexit’ sounds more like the position you would sit in whilst eating cereal.” Worse than that, he said, was that since it was the United Kingdom that voted, “Brexit” leaves out Northern Ireland. Confused? Sure, some would be since so many people consider the U.K. and Great Britain to be the same. However, Great Britain is made up of England, Wales and Scotland (birthplace of my favorite Doctor). The U.K. is made up of Great Britain and Northern Ireland. While portmanteau can refer to a valise or other such luggage, in the linguistic sense it is a blend of “two or more distinct words to create one word with a new, combined meaning,” according to the Oxford Dictionaries blog. 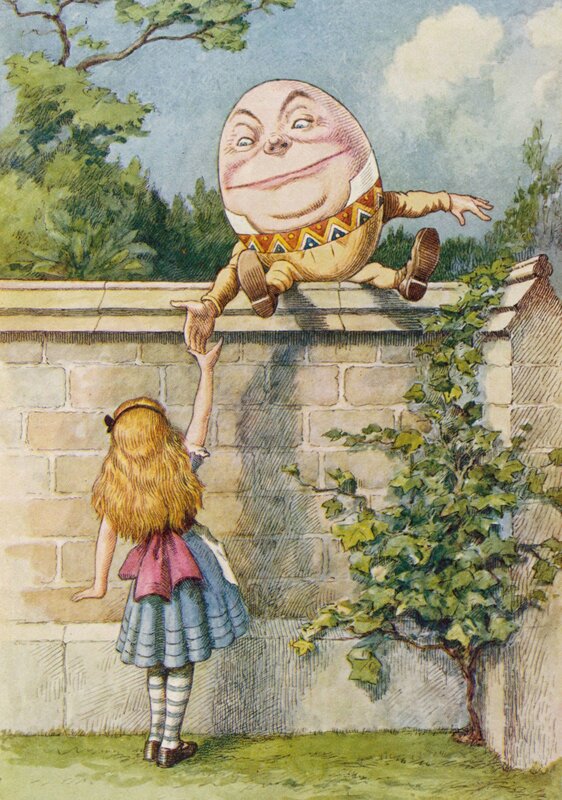 Image by John Tenniel found on Barking Planet. Many portmanteaus inhabit our language, from smog (smoke + fog) to breathalyzer (breath + analyzer) to spork (spoon + fork, and pretty useless with mashed potatoes unless they’re like drying cement) to Obamacare (Obama + health care). 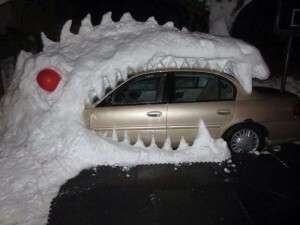 This is the kind of snowmageddon I could live with. Image found on The Valley Patriot. And then there are the ones that make me cringe every time I see or hear them: jeggings (jeans + leggings, a fashion fad that deserves to die), showmance (show + romance, the fake romance that watchers of competitive reality shows like Big Brother have come to expect), staycation (stay + vacation, and why can’t we just go somewhere, anywhere??? ), and many others. Don’t even get me started on all those -gates and -mageddons. And snowpocalypse? Really? People have already started predicting what portmanteaus/exits will come next in the European Union—perhaps Grexit, Italeave, Outstria, Portugo, Swedout—while others would just like the whole thing (portmanteaus and puns involving the EU, not necessarily the EU itself) to come to an end. I’ll be happy if some of the more annoying political portmanteaus pack up and move out—Billary, sheeple, Sarah-cuda, Trumpmentum (though I have a soft spot for Frankentrump, perhaps because of my love for Young Frankenstein, and Baracknophobia … it’s just funny). And portmanteaus like celebutante, cosplay, edutainment and chillax cause much more nausea than this IBS sufferer can handle. 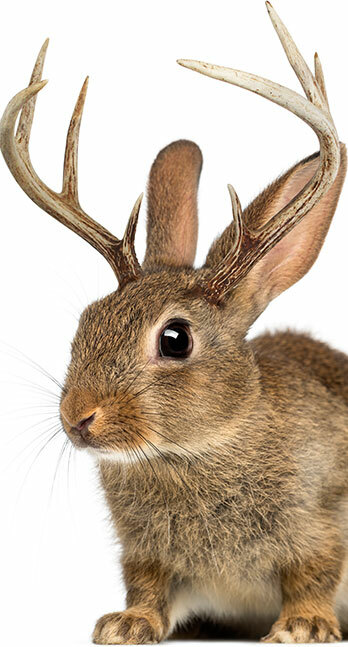 I always wanted a jackalope … if I ever get one, I’ll have Petsmart’s handy-dandy guide to help me out. Still, there are portmanteaus that I quite like, such as chortle, chocoholic and jackalope. Yep, I like the ones that make me laugh … or chortle (thanks for that one, Mr. Carroll). And yes, that means I dearly love sniglets—words that should be in the dictionary but aren’t (thank you, Rich Hall), like frust, the small line of debris that refuses to be swept onto the dust pan and keeps backing a person across the room until he finally decides to give up and sweep it under the rug, or bovilexia, the uncontrollable urge to moo at cows from the car window when you pass them. Growing up in the country, that happened a lot. I used to moo at real cows. 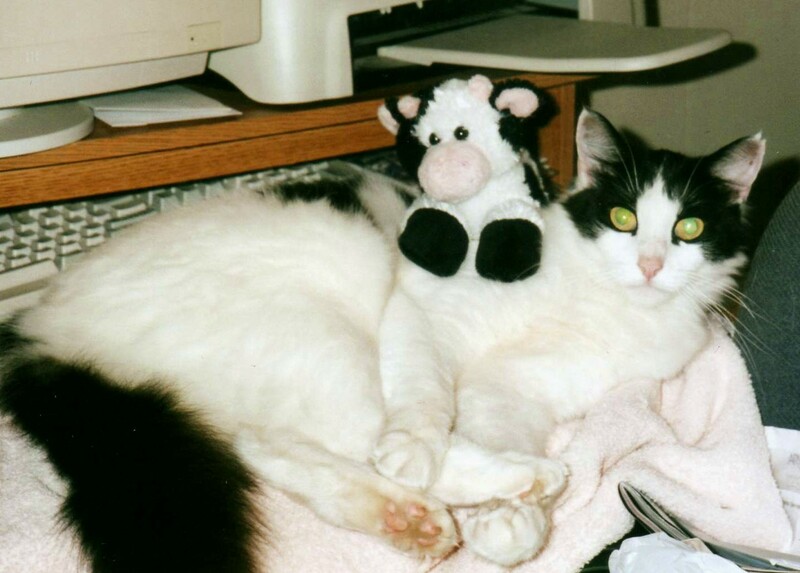 Now I just moo at the furry one with the Holstein pattern. He smells better … most of the time. Sniglets are most certainly creative, so they’re exempt. But really, give it a rest with the sharknadoes, affluenza, listicles, bromances and manscaping. And no tofurkey either if you know what’s good for you.